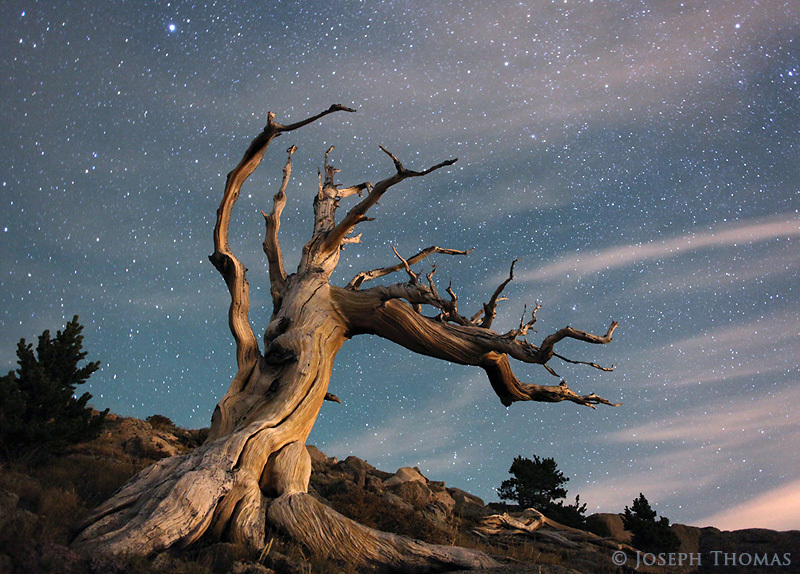 The rising moon illuminates the remnants of an ancient bristlecone pine tree. I had photographed this well-hidden tree at a secret location a few years earlier and came back this night get a star shot. Arriving late with a vague recollection of its whereabouts, I wandered around the mountainside in the darkness for about an hour before finally relocating my old friend. My goal was to juxtapose the twisted limbs that were gradually sculpted by winds over countless centuries against ephemeral clouds that were shaped by the same force in mere seconds. All this plays out before the seemingly unchanging cosmos, giving a sense of time moving on many scales.